"The next best thing to not having a brother (as I do not) is to have Brothers." Here is a tapestry of stories about the complex and unique relationship that exists between brothers. In this book, some of our finest authors take an unvarnished look at how brothers admire and admonish, revere and revile, connect and compete, love and war with each other. With hearts and minds wide open, and, in some cases, with laugh-out-loud humor, the writers tackle a topic that is as old as the Bible and yet has been, heretofore, overlooked. Contributors range in age from twenty-four to eighty-four, and their stories from comic to tragic. 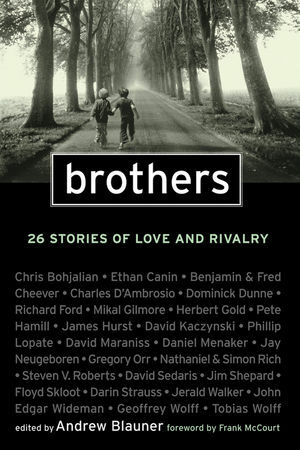 Brothers examines and explores the experiences of love and loyalty and loss, of altruism and anger, of competition and compassion—the confluence of things that conspire to form the unique nature of what it is to be and to have a brother. We’ve heard that the apple doesn’t fall far from the tree. But where do the apples fall in relation to each other? And are we, in fact, our brothers’ keepers, after all? These stories address those questions and more, and are, like the relationships, full of intimacy and pain, joy and rage, burdens and blessings, humor and humanity. Andrew Blauner is founder of Blauner Books Literary Agency, editor of COACH: 25 Writers Reflect on People Who Made a Difference, and coeditor of Anatomy of Baseball.